Pronto! 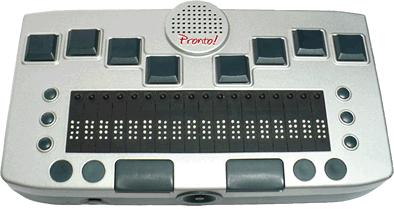 is a portable computer designed for the blind that runs the operating system Windows CE, and through the Braille display and synthetic voice it facilitates for the blind the access to all the utilities of the operating system and to running various applications, exactly like a regular PDA. Worldwide there are no similar products like Pronto!, and we, as Engineering BAUM, are proud of the fact that we offer the blind so many features into a single device. Easy to use and equipped with all the useful features that you need each day. Pronto! provides a variety of functions: Notebook, calculator (standard and scientific), calendar with journal functions, addresse database and phone numbers. At a finger touch you get date and time, temperature, altitude and other information. 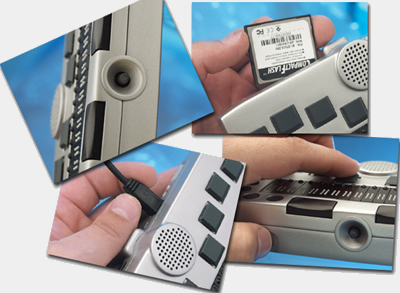 The product offers the possibility of recording or listening to music using the integrated MP3 player. Internal memory of 64 MB RAM and 32 MB Flash Memory can be expanded via CF memory cards available everywhere (like those used by digital cameras). Pronto! is a product easy to maneuver and simple to operate: although it has many functions, we put much accent on a simple user interface. The most important functions are started by pressing only a button, even if the device is switched off. The functions are easy to learn, but effective. Braille navigation keys are conveniently located to the left and right display Braille, alternative, a new mini-joystick can be used. With Pronto! you get a "box" easy to handle. You can use a bracelet for shoulder or can hang it your on belt. It can use all the functions of Pronto! in the box: reading and using a mobile phone at the same time. Find a recipe while cooking. No problem. Reading a book in a public bus with an unexpected stop. No problem: Pronto! remains safe in the "box". Software Pronto! Can be improved or using CF cards, or by downloading from a PC. Speech: Speech quality for different languages; two languages are possible at the same time; integrated speaker. Support for mobile GSM phones (read and write SMS). Interfaces: Compact Flash Type II Slot, USB (Slave), Infrared (IrDA), BT (Bluetooth), serial, PS2, Phone. Housing: high quality casing as that of modern cameras.